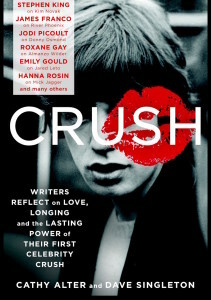 CRUSH (HarperCollins) launched in April 2016 with a hardcover and audiobook. The paperback came out February 2017. With NEW essays by James Franco, Stephen King, Jodi Picoult, Andrew McCarthy, and 34 others, including me. We’ve gotten great reviews in Kirkus Reviews (a starred review), Publisher’s Weekly, Library Journal, The Washington Post, Entertainment Weekly, Vogue, Oprah, Cosmopolitan, Harper’s Bazaar, Redbook, In Touch. People magazine Best Book of the Week (April 8, 2016). Amazon.com April 2016 Best Book of the Month. This entry was posted in Books, CRUSH (Coming from Harper Collins Winter 2016). Bookmark the permalink.